The Summer of 2014 marked the 25th anniversary of the film that made Dyersville, Iowa more than just another place to grow corn. Field Of Dreams was one of the most popular movies of 1989, earning three Oscar nominations including one for best picture. While driving to the field, which is quite literally in the middle of nowhere – one has to stop and think just what luck it took to find this filming location in the first place. It’s not like it’s off a major interstate and the two lane roads surrounded by various crops remind you how lucky we are to have GPS. 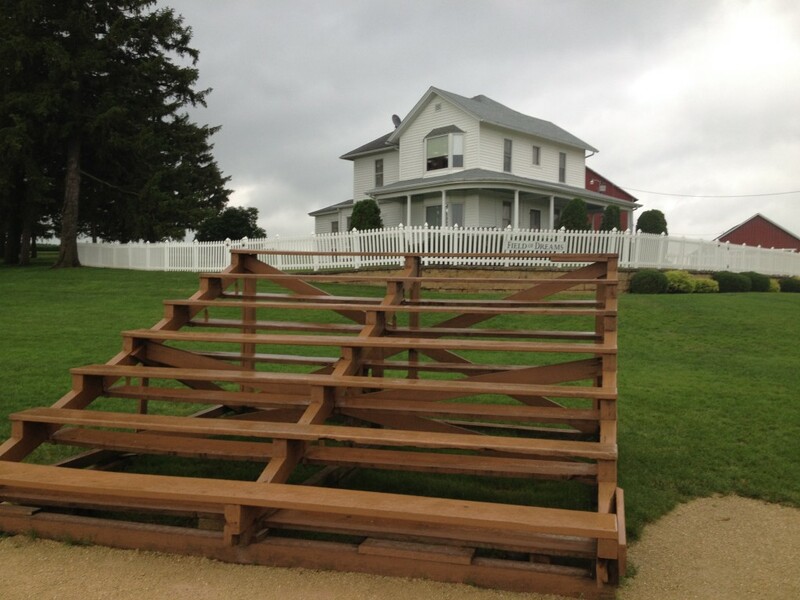 There’s simply a small brown sign a few miles down the road to tell tourists, like me, that the Field Of Dreams filming location is up ahead. Like any TV or movie set, it’s much smaller in person. Even with a light rain shower on this Sunday morning, at least a dozen cars were already in the parking lot – stopping by for a peek. A handful of young kids were on the field, throwing a baseball around and running the bases. A walk through the wet grass to the outfield was a must, although my attempt at a “selfie” picture with rows of corn behind me didn’t turn out how I had hoped. This rural location doesn’t scare away everyone – in fact, over 60,000 visitors a year make the trek while passing through Iowa. It doesn’t cost anything to visit. No doubt the land owners figured “If you build it, they will buy” – after putting up a gift shop with tee shirts and other Field Of Dreams related gear across the parking lot. No small town would be complete without a little bit of drama – a spat of lawsuits have been tossed about in recent years over plans to build around the former movie location. While it appears the legal dust has settled – some billboards are still nearby that ask visitors to “help save the field of dreams”. For a fan of the film – it’s a must if you’re passing through Iowa. Otherwise, it’s just another neighborhood baseball diamond. Minus the gift shop and rows of corn. 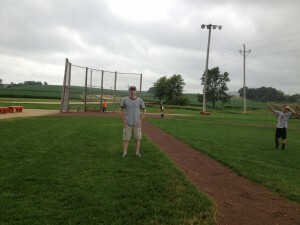 If you’d like to make a visit of your own – you can visit the official Field Of Dreams website for driving directions and other related information.